In season 4 episode 7, “The Initiative”, a soldier looks through a thermal camera, in search for a vampire. He sweeps the university dorms, watching the camera as it spots hot bodies and marks them as human… until he hits a blue shape. “Room temperature!” he exclaims, using that to recognize the vampire. … wait… Really? Room temperature? If the vampire’s room temperature, how would the thermal camera distinguish between the vampire and the rest of the room? If the vampire was room temperature, you wouldn’t see them through that camera, just like you wouldn’t see the shape of the bed, or a vase in there… would you?? But bear with me, because this gets a little worse before it gets better: The camera displays the vampire as bluer than the room, which means it recognizes it as colder than its environment. Colder than room temperature… so… would he be? Would a vampire be warmer, colder, or room temperature? Is the soldier wrong, is the camera wrong, and is there even a way to tell!? Well… Yes. 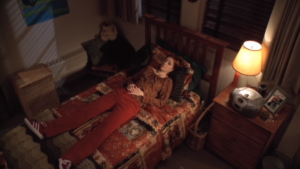 There is a way to tell, and it’s pretty spot-on science, too, so strap in, scoobies — it’s time for some Buffy physics! If you read Wikipedia, it would tell you that Thermodynamics is “the branch of physics concerned with heat and temperature and their relation to energy and work”, which is (as often is with Wikipedia articles about science) absolutely true. Thermodynamics deals with temperature changes, and how objects regulate their heat transfer. Zeroth law of Thermodynamics: If two systems are in thermal equilibrium with a third system, they are also in thermal equilibrium themselves. Equilibrium is the state where a system is at balance. If you have a hot object in a cold environment, the system will attempt to reach a balance — the hot object will “shed” heat into the environment, which will result in the object cooling, and the environment heating up, until both are balanced with the same temperature. First law of Thermodynamics: When energy passes into and out of a system, the system’s internal energy changes in accord with the law of conservation of energy. Basically, this means that energy is conserved, and that perpetual motion machines of the first type (where energy is miraculously created out of nowhere) are impossible. Second law of Thermodynamics: In a natural thermodynamic process, the sum of entropies of the interacting thermodynamics systems increases. This law very generally means that when energy changes forms in a system, its entropy (disorder) increases. Meaning if there’s a transfer of energy in the system, the system also loses order and becomes more random. You pay for energy exchange. Energy isn’t free. An example would be a campfire; you burn solid strong logs to emit heat, but in the process, the log breaks apart into ash and smoke and all sort of gasses, which, in turn, burn faster, and will never combine again into being a wooden log. It also means that perpetual motion machines of the second type (where heat/energy is transferred into useful work but without any other effect, like loss of useful energy to create more energy) are impossible. Third law of Thermodynamics: The entropy of a closed system approaches a constant value as the temperature approaches absolute zero. This is a fancy way of saying that a system at absolute zero also stops changing. Absolute zero is the lowest temperature that’s theoretically possible, where the motion of particles that constitute heat would be minimal. It’s zero degrees Kelvin, which is -273.15 degrees Celsius, or -459.67 degrees Fahrenheit. Simplified: Super-cold systems are frozen. So what does that all mean? The most important concept that we’re going to delve into is the way temperatures balance out in objects that share the same system. Much like humans, objects are affected by their environment. Very generally and simply, if an object is in warm environment, it will absorb heat and warm up. If it’s in a cold environment, it will “shed” its heat and cool. This is another example of the principle of equilibrium: Hotter temperature is higher energy, and in a (closed) environment, energy is preserved, meaning warmer objects will balance out with colder objects, spreading the energy around so it’s in “thermal equilibrium,” meaning (usually and for the most part) that they all have the same temperature. That’s how conservation of energy happens. The easiest way to think about how this happens in our lives is the pavement. During the day in the hot sun, the pavement heats up. During the night, it cools. But it doesn’t do that instantaneously; it takes a bit of time to heat up or cool down, which we can notice if we walk on it, or if we drop our keys into a puddle in Manhattan and get on our knees to fish it out… not… that it ever happened to me… or anything. You’d notice that earlier in the morning, even though the sun is shining bright and the day is hot, the pavement is still cold to the touch. And at night, even if it’s chilly outside, the pavement can still be warm to the touch while it cools down. The speed at which an object warms up or cools down has to do with several variables — the initial temperature of the object itself, the temperature of its environment, and the material the object is made of, which affects how quickly the object transfers energy — or, in other words, how quickly it would cool down or heat up. This is the heat transfer coefficient. In the episode, the soldier is holding a thermal imaging device that shows him different bodies with their “heat signatures” until he spots the anomalous vampiric one. Before we delve into what that means and whether the anomalous reading would have even happened, and whether the soldier is reading his own device properly (muttermutter) let’s very briefly check into how thermal cameras even work. 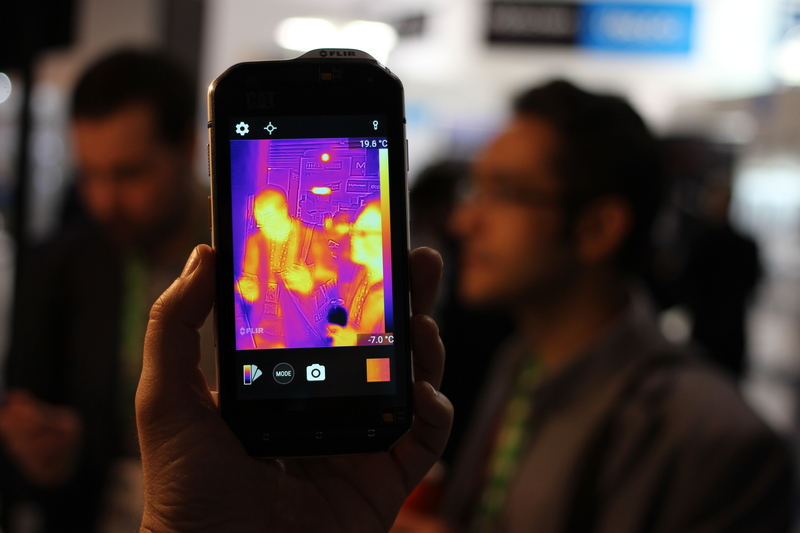 Thermal cameras have infra-red lenses that focus infrared light from whatever they’re looking at, and translate the infrared radiation visible light that we can see on their screen. Infrared energy is a piece of the electromagnetic spectrum, that itself includes all types of radiation, from gamma rays, x-rays, ultra violet, and the visible light spectrum that we can all see with our own eyes. The higher the object’s temperature is, the more infrared radiation is being emitted (through black-body radiation). So, if the camera analyzes the radiation it receives, it would attach blue-to-red colors according to the intensity of the area the radiation is coming from. Hotter objects will be painted redder, and colder objects will be painted bluer. This is true for these type of thermal devices; other devices (and you can see that in some movies and TV shows) may paint the picture green to red, or any other color. Red usually symbolizes “hot”, though. Somewhat obviously. Anyone who’s dealt with TV remote controls knows that infrared isn’t very good at passing through walls; worse, most buildings that carry humans in them use walls that have some insulation — which inherently means that heat is trapped inside. So… the ability of a remote camera looking into a building and spotting people, objects, and vampire heat signatures, through the walls, would be incredibly improbable. That said, the beams would travel through windows, so we can assume that the camera angle we’re watching this scene through is just off, and the soldier is actually looking through a series of windows into the dorms, which would allow them to spot the infrared radiation that tells us of the heat signatures of objects and vampires inside. Now that we know how thermal cameras work, and the basics of thermodynamics, the actual question of this episode is evident: What would a vampire’s heat signature look like? Or, rather, would the vampire be hot, cold, or room temperature? Generally speaking, we go by the universal rules of physics that the show gives us. In this case, we have a thermal camera, and it seems to show the vampire as colder. The soldier is telling us that the vampire is colder than the humans (whether they’re right that they’re “room temperature” or whether the camera is right that they’re colder than that is to be determined). Since that’s the case, we’re safe in assuming vampire bodies are, in fact, affected by thermodynamic calculations, so we can delve into those. The vampire in question in this scene has spent their day in a cool crypt, then a cool room, and then the night’s air. All three environments are cold to cool — and are definitely colder than the room he walked into. We already talked about how objects (and bodies) are (slowly but surely) adjusting their temperatures to their environment. While living bodies also have a mechanism to emit heat because of the blood circulation that’s going on (though even that is fairly limited; sit in the snow without insulation for a while and your body is dangerously and rapidly going to cool down) — vampires are dead. Which means that their body heat is more similar to dead bodies than living ones, and that their body temperature is more easily adjusted (and is varied) depending on where they are. Buffy with a light jacket in the outside air. She has a light jacket, so the night seem cool but not too chilly. Let’s say 15 degrees celsius (60 degrees Fahrenheit). If the vampire spent his day in a crypt, he’d be much colder, but since the episode has him outside and inside a cool room, we can probably average to the outside temperature rather than go lower. Well, Willow looks comfortable on her bed, and while she has thick pants and shoes on, she doesn’t seem to have any covers or a jacket. We can assume the room is cozy, but not too hot, but for consistency, we can just call it “room temperature”. There are a couple of accepted definitions for this term, but the general agreement seems to be around 20 to 22 degrees celsius (68 to 72 Fahrenheit) so we’ll call it a solid 20C. We have initial temperature, and we have ambient (room) temperature. The equation also uses a \(k\), which is the “cooling constant.” What would that be for a vampire body? Vampires used to be human (or at least that’s true for the vampire we’re talking about in this episode) so we can use the cooling constant for a human body. Where would we find such a constant (and who the hell tested for that?) you ask? Coroners. Yep, you heard it right, and it’s no surprise, really. Coroners (and CSI, for that matter) are testing for “time of death” by measuring the body temperature, comparing it to the ambient temperature, and deducing from that how long ago the body stopped producing its own heat, and started cooling. There’s actually a pretty fascinating mathematical explanation on how that constant was found, if you care to read a bit of differential equations. The bottom line, though, is that the constant was found to be \(0.223\). We use that, then. So, what would the thermal camera see?? 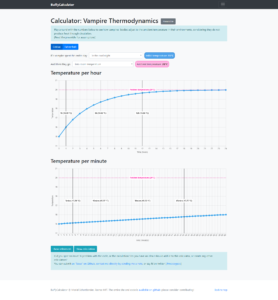 Now that we have all the variables, we can start calculating the expected temperature of the vampire in the room, as his body slowly warms up to ambient temperature. From the episode, it seems like the camera would look into the room after a few minutes, so instead of assuming a time, let’s check the temperature in intervals. … it will take the vampire almost 12 hours to get anywhere near room temperature. The soldier was looking through the camera after only a few minutes. There is no way the vampire was anywhere near room temperature, and the thermal camera would see that. The soldier is wrong, and the camera is correct; the vampire in question is, indeed, colder than room temperature, and will continue to be for several hours until his body warms up. Listen to your instruments, soldier! As for us… well, maybe finding a vampire with heat signatures isn’t the best idea ever, considering your vampire in question may have just spent their entire day in front of a fireplace, flexing and doing tai chi. Want more Buffy? You should listen to the incredible podcast “Buffering the Vampire Slayer” and enjoy the original songs written for every episode! Interested in more Buffy physics? Read Jennifer Ouellette’s excellent book “The Physics of the Buffyverse“!